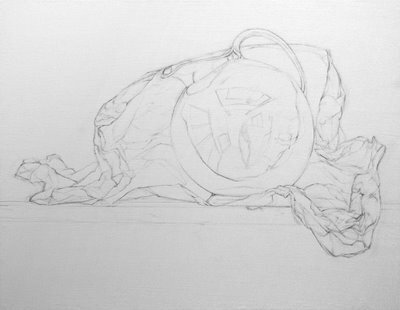 This is the completed underpainting for my most recent Wax Paper Series painting. I started this composition with sketches and a detailed contour drawing you can see in this previous post. Using trace paper I transferred my drawing to the gessoed panel. I refined the drawing directly on the panel in pencil. My goal was to get a very accurate drawing that described the gesture and energy of the crumpled paper, as well as a very precise geometry for the silver globe pitcher. Badly drawn round and elliptical objects in still lifes look wobbly and unconvincing, so I took a lot of time to make sure the silver globe is the correct shape. The pitcher needs to have a believable structure to make the whole painting convincing. Once I was satisfied with the drawing (although I'm never satisfied with the drawing) I moved on to a transparent wash underpainting. 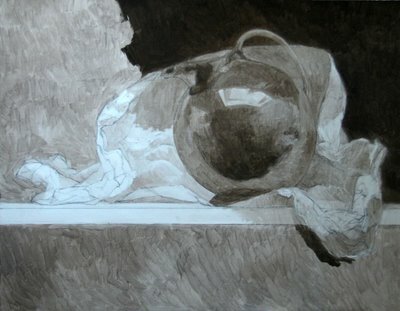 Traditionally artists use a tiny brush to outline the contour drawing to "set" the graphite. I've never felt the need to do this, I find that this first wash layer of underpainting sets the graphite and I don't ever notice the pencil marks mixing with the paint in later stages. Most traditional artists would advise against this, though. With the underpainting I "knock down" even the lightest lights. I've learned it's annoying and difficult to paint white paint over a white ground, so I cover every part of my surface with at least a light layer of umber paint. But I try to get a fairly full range of values so I can get a feel for what the whole painting will look like. 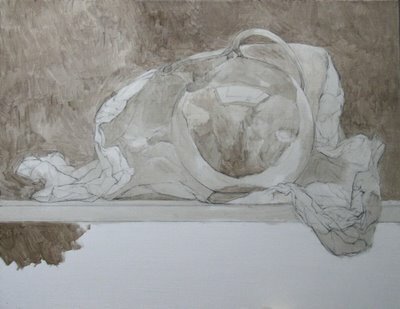 Below I have finished the underpainting and started a small part of the opaque layer. The underpainting is transparent, meaning I use turpentine to thin the umber paint to show the white of the panel beneath. 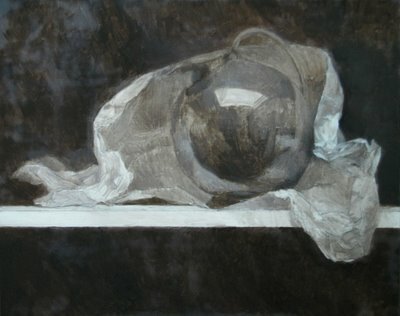 The opaque layer uses white oil paint. As you can see in the final underpainting above, there are some patchy "dry spots" especially in the upper left dark area of the painting. This is where the paint has started to "sink" into the gesso ground, and the more matte areas look chalky. This will be solved with later layers of medium-enhanced paint, so the background will look deep and dark. So far I am really enjoying working on my hand-gessoed panels. The surface is silky and smooth but the paint really seems to "grab" it. It feels good to paint on. Which makes me happy, because gessoing the panels was a lot of work! To bring the painting to a convincing finish I'll have to work at least two more layers of opaque paint over this layer, probably several more in many places. At this stage I'm just laying down a "bed", so the general values and basic colors are correct. With these decisions solved I will be able to really focus on one area at a time without having to constantly back up and compare the values and colors to the rest of the painting. Getting the tonal relationships right, right off the bat? Hey, there's an idea! It seems kind of obvious once you see it, but right now, to me, it's new and shiny. Here's a stupid-ish question: do you ever find it a problem when you start working with opaque paint and it basically covers up the detailed drawing underneath? How do you deal with that? I have had a couple of bewildered moments at the canvas when I am covering up details I know I am going to need later, but there is no way around it once the opaque layers go on. I think I actually abandoned a painting this summer in large part because of this problem. Not a stupid question at all, something I struggle with myself. One thing I constantly remind myself to do is not just trace or copy the decisions I made before, but make every new piece of information correspond to what I am seeing. So, even if a stroke of paint obliterates an earlier contour line, that new stroke still contains all the information I need about the contour. But it is a dilemma anyway - I try to keep edges soft as long as possible, until I decide which ones are crisp, and making a soft edge over a previously "sharp" contour (sharp being the nature of contour) can obliterate some information. But for the way I paint, this is usually at a near-microscopic level, so as long as the general tilt of my contour is not lost, I can recreate it later by looking at my subject. I notice I get most lost/frustrated when I look at the paint too much. Focus on the subject, not the paint. Very nice start, Sadie. I've been finding your blog to be very informational. I'm sure it was difficult to get the shape of the pitcher just right. 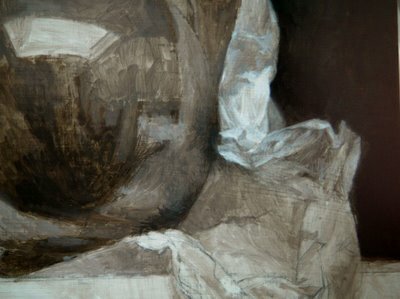 Do you worry about maintaining the "life" of the original drawing to the gessoed painting surface? Do you mean "life" of the drawing as in the expressiveness of a reactive, un-analyzed drawing? No, I don't worry about that at all, actually. I think the expressionistic "first stroke is the best stroke" philosophy doesn't really work for me. I find the closer I look, the more I refine with deeper understanding, the more "life" (gesture and structure and feeling and believability) my drawing has. For my methods at least, it takes careful and slow analysis and several reworkings of the drawing to achieve this. I believe that the final version of my drawing has more life than my first. If it doesn't, I've just gotten too tired and overwhelmed by detail and I just take a rest and come back to it later. Very nice steps and results. I really like the underpainting showing through. Thanks for sharing.